1. Open the Label Style Composer by creating or editing a label style for the object. 2. In the Label Style Composer dialog box, click the Layout tab. 3. Select an existing component from the Component Name list, or add a new component for the label text. 5. In the Text Component Editor dialog box, click the Property Sets tab. Note: The Property Sets tab will not appear in the Text Component Editor if there is no property set applied to the relevant object type. 6. 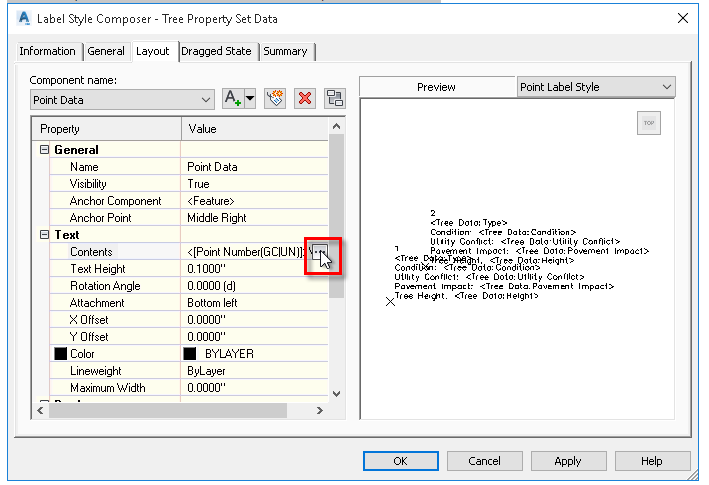 Select the property set definition to use and the property to insert. 7. Click to insert the property into the text window. In the following example, the Type property has been added to the label style after the point number. 8. After adding each property into the text window, click in the window and press Enter to insert a paragraph return. 9. Add static text as needed in the Text Component Editor window, such as “Condition” or “Tree Height”. To do this, click in the Text Component Editor window and enter the text directly.